Signs of study appear throughout the manuscript in form of notes in margins and between lines. 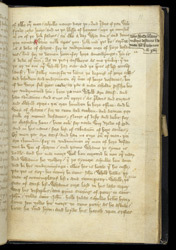 On this page, a subsection title has been added in the margin, the beginning of the subsection marked in red in the line beside the note. The manuscript has no decoration or coloured inscriptions to highlight the beginnings of sections of text.